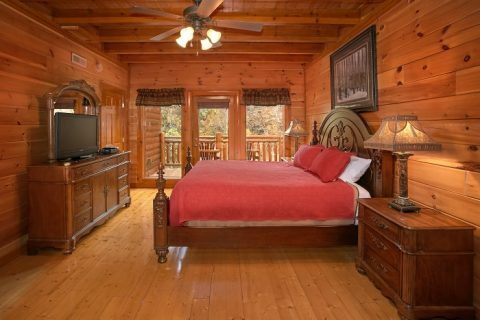 Welcome to "Grand Theater Lodge," a luxury 8-bedroom cabin that's ideal for group vacations in Pigeon Forge, TN! 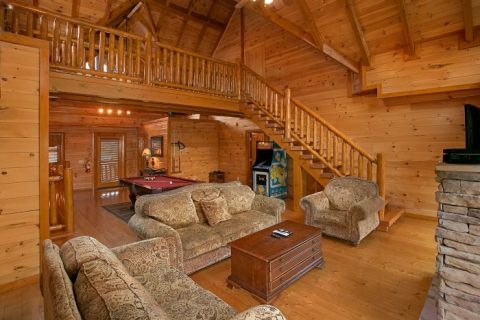 This large lodge in the mountains boasts plenty of sleeping space for up to 24 guests. As a result, everyone in your group can stay in the same comfortable cabin without having to book several hotel rooms. 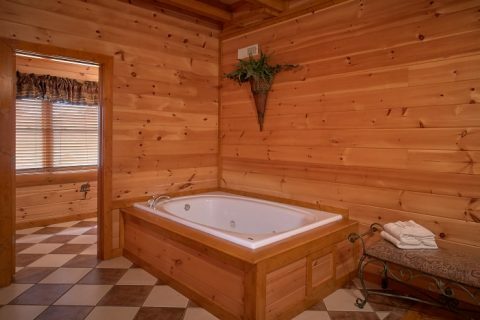 Better yet, this log cabin boasts several amenities that can make your stay a true delight! 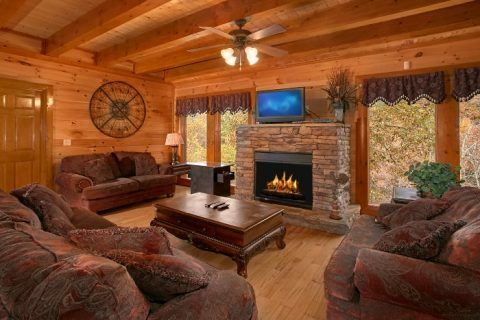 Step inside this premium cabin in Black Bear Ridge Resort to find the inviting living room area complete with a stacked-stone fireplace, a flat screen television, and comfortable seating space. 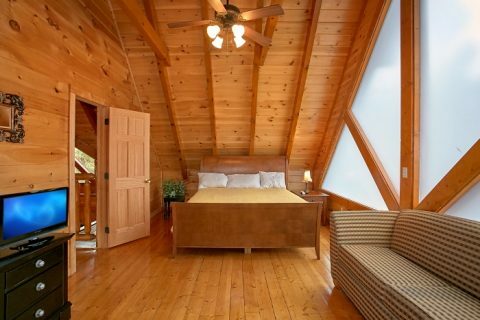 This room's floor-to-ceiling windows highlight this cabin's beautiful forested location on the side of a mountain. 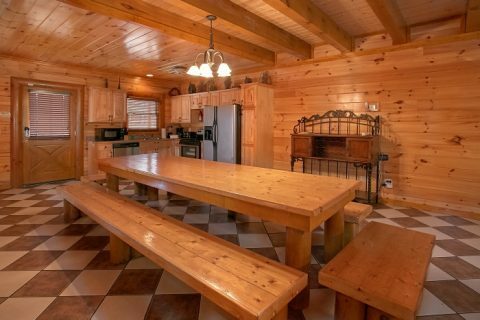 Your cabin's full kitchen features modern appliances and a nearby dining area with two tables for enjoying great meals with your family and friends. 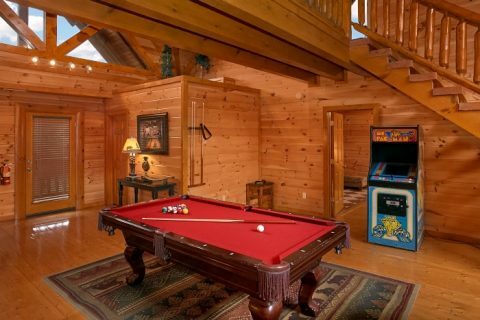 Additionally, this level features two arcade games for enjoying some friendly competition during your stay. 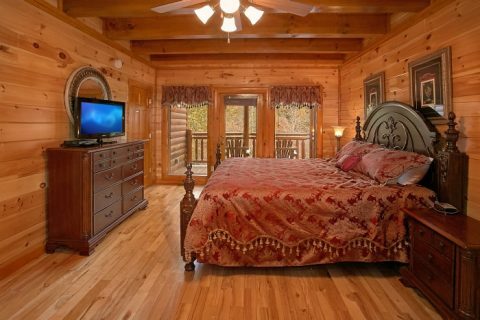 There are two king-size bedrooms on this floor that each provide a king bed, 32" flat screen television, a private jetted tub, and full bath. 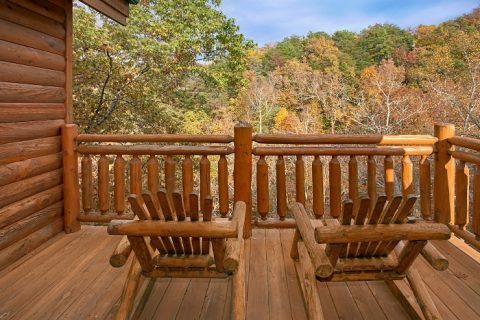 From these bedrooms, you can step outside onto a private balcony with rocking chairs. 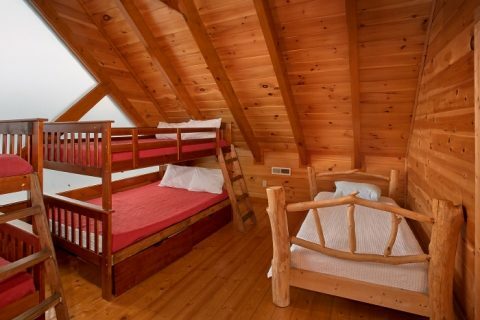 For extra sleeping space, one of these rooms provides a sofa sleeper. 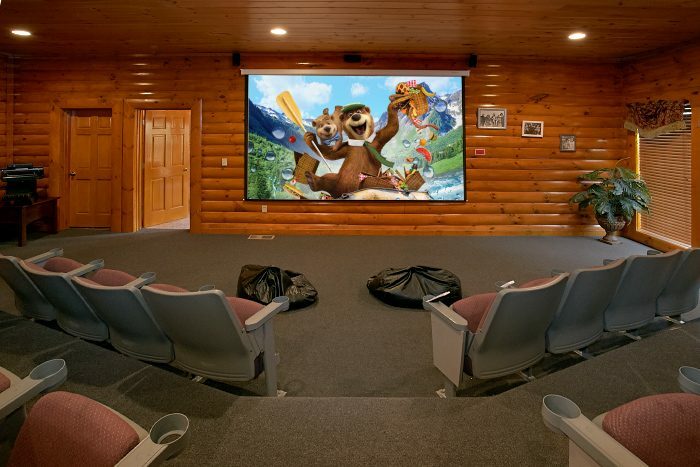 For even more in-cabin entertainment, head upstairs to a game room and living room area that boasts a pool table, sitting area, electric fireplace, and a flat screen television. 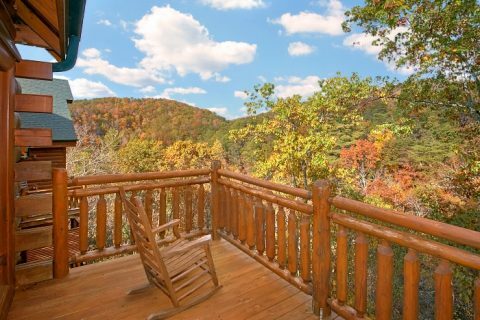 To appreciate your cabin's lovely forest views, step outside onto the 2nd level deck. 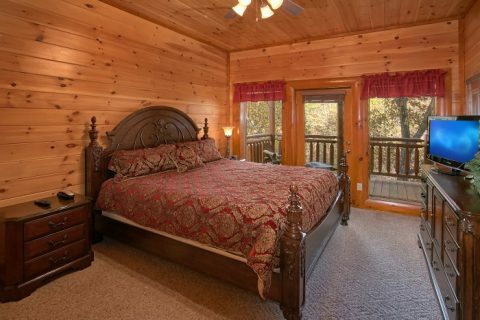 Additionally, this floor offers 2 more king-size bedrooms with flat screen televisions and private baths. 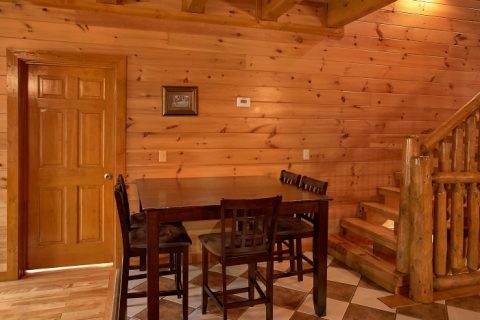 On the top level of your rental, there are two more private bedrooms. 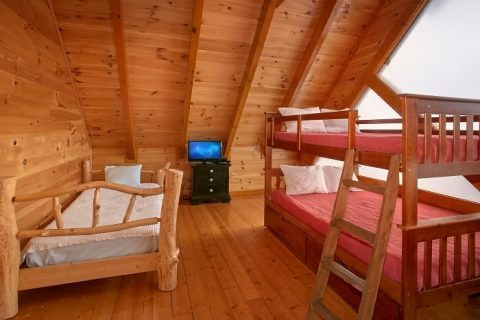 One of these rooms provides a king-size bed, sleeper sofa, and private television, while the other features two full size bunk beds and two twin beds. 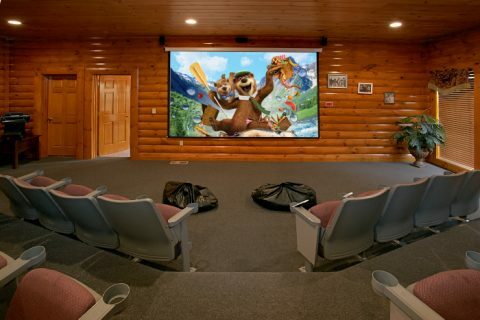 For an unbeatable movie watching experience, head downstairs to your cabin's full theater room with a projector screen, Blu Ray DVD player, and 16 theater seats. Lastly, this level is home to two more bedrooms. 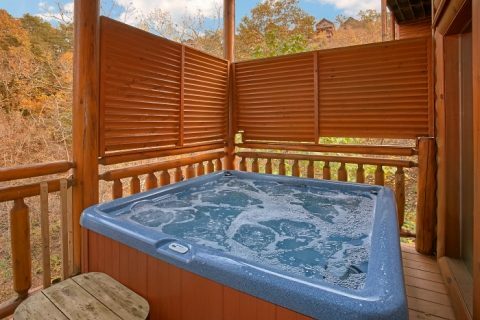 One offers 2 queen size beds, a TV, a half bathroom, and access to a lower deck with a hot tub. 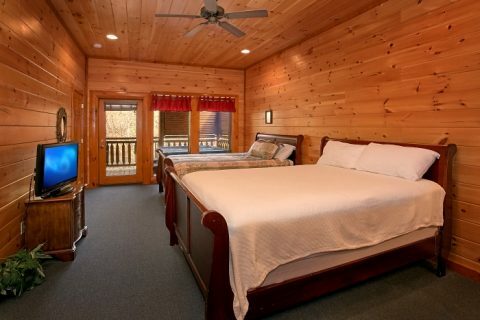 The last bedroom has king bed, a full bath, television, a small deck with rocking chairs. 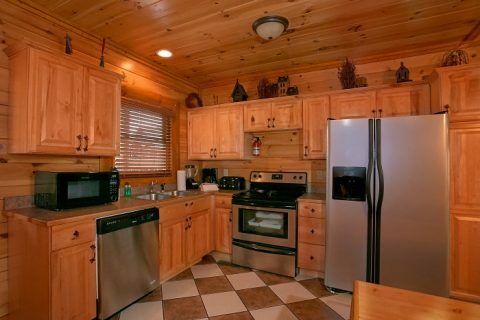 Guests of this cabin will also appreciate having a washer/dryer and a charcoal grill during their Pigeon Forge vacation. 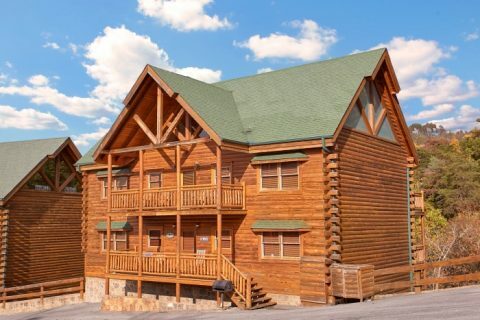 Bring your group to a truly luxurious cabin only minutes away from Pigeon Forge, TN! 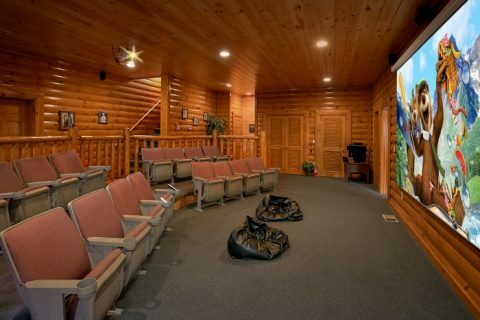 Simply book "Grand Theater Lodge" online with Cabins USA to save 15% on your getaway to the mountains of Tennessee!